We arrived in the capital city of Suva on June 17 to warm sunshine over beautiful, rugged green mountains. The passage from Minerva was three unexpectedly nice days of sailing (we expected to motor). There was lots of fresh fish to supplement the dwindling larder (we ran out of bread and just about all of the fresh produce). Crew Chris needed to get back to commitments in NZ after the 8 day trip that lasted close to a month. The alternator, a critical part of our electric supply, stopped functioning a few hours before we arrived. We were ready to be in port. No matter, shut up and wait. It took 26 hours before our passports were officially stamped and we were free to move around. In the meantime, the refrigerator and freezer were turned off and what was left was quickly melting in the heat. Our cruising friends on Asylum and Scholarship arrived to a big barbecue of our defrosting meat. 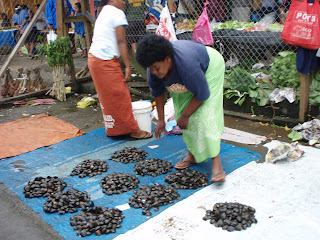 Suva’s a big town for the South Pacific, a major port, a bustling commercial center, and the hub of higher education, regional governance, and aid for the South Pacific. The East Indian population of Fiji is concentrated here, with restaurants, temples, mosques, sari stores, al-Jazeera TV and Bollywood movies. 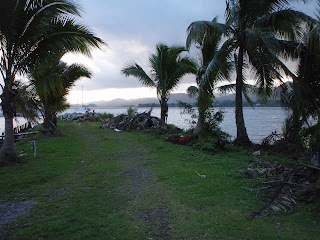 There are Chinese and Japanese enclaves, white expats, lots of Samoans, Tongans, Solomon Islanders. And then there are the very friendly Fijians. Formerly cannibals, they greet you with “bula”, big smiles and lasting eye contact. While still a third world backwater, the city is remarkably tidy, quiet and well-organized. Great shopping (better than Auckland) and lots of modern air conditioned office buildings with computers on the desks and vision and mission statements posted on the walls. The public market is wonderful. However, you wouldn’t swim or fish in the harbor. Other than the day we arrived, it rains almost all the time. We are told to watch out for pickpockets and not to be on the streets at night. And a poisonous snake has decided that it likes to hang out in our dinghy motor. Now that is creepy. Two weeks later, we are still here, still waiting for replacement parts, and no idea of when we will be able to leave. What a life. Anything I can do to expedite the alternator?